The TTIP negotiation is taking another leap of faith as it delves into the question of public procurement this week. The topic is inarguably a thorny issue where market access gets linked to “sub-central” levels of decision-making (State or even Municipality “independent” choices), national security and jobs policy. Yet the U.S. procurement market is, by any means, sizeable, and the EU has made it a pivotal objective to open up procurement at sub-central levels, enabling EU companies to bid for State level tenders. Dealing with these issues requires thus an honest assessment of the situation, present and future. It raises two matters to be discussed: A reality-check on the real openness of the two negotiating partners and a better view of the broader situation in the future. There has been something of a ‘beauty contest’ over which country is the ’most’ open in terms of public procurement in recent years – and the EU has appointed itself as the fairest in all the land. This statement was based on estimates that the “de jure” openness of the EU procurement markets was at 85%, while the U.S. was only at 32%. The EU was so confident that it did not even realise that such asymmetry in openness would imply the EU negotiators did a poor job negotiating government procurement in the WTO during the 1990s. But the reality is such that the U.S. and EU trade negotiators reached almost a perfect balance of the negotiations between the EU and the U.S. in terms of value of the markets opened (Schott and Buurman, 1994). The EU is so confident about its openness that it has recently enacted the Public Procurement Initiative that calls for “reciprocity” – opening the option to deny access to firms originating from markets that the EU believes less open than its own. Fortunately, two recent complementary sets of world input and output data (WIOD, Timmer et al, 2015; OECD, ICIO, 2015) allow us to have a much more accurate and robust information on actual openness of public procurement markets, and these real-life data shows a strikingly different picture: The openness of the EU and the U.S. towards third countries (non-EU and non-US) in public procurement is around both 4-5%, depending on the set of data. In fact, EU was less open than the U.S. until the late 2000s, and did not catch up with the U.S. until the 2008 financial crisis. Note: Penetration ratios are the shares of (extra-EU in the case of EU Member States) public imports in total demand for public goods and services. Source: OECD ICIO, June 2015; authors’ calculations. It should be borne in mind that the penetration ratios of very large economies – such as the U.S. and the EU – are averages that hide both ‘more open’ and ‘more closed’ sub-regions within the EU and the US. This observation can be verified for those EU Member States where data is available. Europe as a whole is not more open partly due to the fact that the larger EU Member States – precisely those which have been the most vocal in the beauty contest – are among the least open EU Member States. Unfortunately, detailed information on State level is not available for the U.S., and TTIP negotiations may offer the opportunity to fill up this lack of information – for the sake of facilitating realistic requests from the EU, and the interest of U.S. consumers. Europe’s strategy on public procurement in TTIP and in other preferential trade agreements is also built on another illusion: The assumption that by leveraging on the Single Market, the EU can forcibly open other markets, including the U.S. But does the size of the Single Market pose a credible incentive (or threat) against the U.S. and other EU trading partners to open up? It’s very unlikely in the TTIP context. 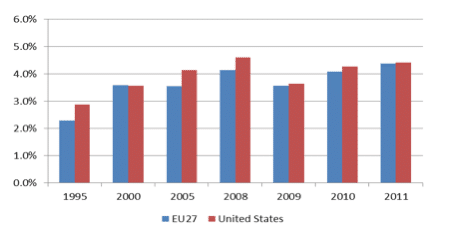 A comparison shows that the EU public procurement is generally outspending the U.S. government, but there are periods in recent years when it has not. Furthermore, the EU public procurement markets of two large EU Member States (France and Germany, or “EU2”) are roughly the same size as Japan’s, and already smaller than China’s. Moreover, the procurement markets in the rest of the world are growing more rapidly than those of the entire EU or of the largest EU member states – the combined result of more open public procurement markets (Korea or Taiwan), more quickly opening public procurement markets (Japan) or rapid economic growth (China). Source: World Output-Input Database, November 2013; authors’ calculations. The credibility of the EU’s threats on public procurement is increasingly dented, as it would harm EU businesses. Worse, threats could induce other increasingly large trading partners to adopt a “reciprocity” tactic against the EU. As a result, the EU threat would be meaningful only in case of smaller trading partners. But then, it remains to be seen whether this situation has positive net benefits when one takes into account the substantial political costs that are likely to arise for the “bullying” large country. These hard facts – the vanity and illusion of the beauty contest, the increasingly limited credibility of threats from the EU (or any other large economy) – should be seen as very positive incentives. They present trade negotiations – such as TTIP – in a totally different perspective: As an opportunity to evaluate better the past policies and to look for appropriate domestic regulatory reforms. After all, these hard facts also raise hard questions: Why are the EU and U.S. public procurement markets so much fragmented after two decades or so of efforts? What are the responsibilities of EU Member States? Which kind of domestic regulatory reforms does these relatively closed markets need? In short, how can the EU and the U.S. use the TTIP negotiation process for improving the national regulations on both sides of the Atlantic – for the sake of improving citizens’ welfare? Messerlin, P. and S. Miroudot 2012. “EU Public Procurement Markets: How Open Are They?” GEM Policy Brief, July. Available at http://gem.sciences-po.fr/content/publications/pdf/Messerlin-Miroudot_EU_public_procurement072012.pdf. Messerlin, P., 2016. How Open Are Public Procurement Markets? in B. Hoekman, A. Georgopoulos and P. Mavrodis, The Internationalization of Government Procurement Regulation, Oxford University Press. Forthcoming. Schott, J. and J. Buurman. 1994. The Uruguay Round. Washington, DC: Institute for International Economics.